There's only so many times that the Canadian government, which is notoriously hostile to foreign investment, government can "lose" your paperwork and make you resubmit it, and something tells me that Canada has hit that point with Amazon. Early this morning David Gaughran tipped me to the news that Amazon was now mentioning a Canadian Kindle Store in their correspondence with KDP authors. After doing some digging of my own, I can see that he is correct. Update: The Kindle Store is live on Amazon.ca. Have you ever spent some time looking at the report pages at KDP? There's a lot of different ways to generate sales reports: date, title, and most importantly, by market. 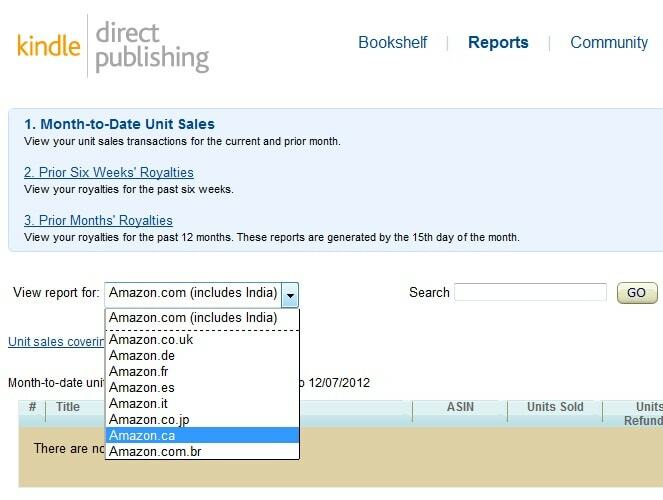 Amazon will let you generate a sales report for each of their local Kindle Stores (amazon.de, amazon.co.uk, amazon.com.br, etc). And as of today, Amazon will let me generate a sales report for Amazon.ca. Given that Amazon does not yet sell Kindles or Kindle ebooks on their Canadian website, this is a rather curious detail. Update: Amazon has not yet updated the entire Amazon.ca website, but I can now see Kindle ebooks on the site. There's no mention of the Kindle hardware, though, just the ebook and the apps. I also have not yet gotten a press release announcement from Amazon. Amazon has been selling Kindles and Kindle ebooks to Canadians since the Kindle Store went international in 2009, but in spite of the fact that Canada is America's closest neighbor, Amazon has not opened a local Kindle Store there. Even though Amazon has launched local Kindle Stores in the UK, France, Germany, and even Brazil, there's never been any sign that Amazon was about to launch a Kindle Store in Canada. Oh, I'm sure that it was in the works, but I would also put money on the launch being delayed due to the Canadian govt dragging their feet. In fact, I would bet that Amazon started working to launch the Canadian Kindle Store at the same time that they started on the UK Kindle Store. It just took a while to get government approval. It's my guess that the Canadian Kindle Store will launch in the next month. I am guessing a month because the last time Amazon leaked details about a Kindle Store launch was with Brazil, and in that case it was about 26 days between the earliest leak and the launch. Actually, I am expecting the launch to happen some time in the next week. The Christmas season is upon us, and I'm sure Amazon doesn't want to pass up any chances to sell Kindles. This is a bit erroneous. You can buy Kindles directly from amazon.ca. In fact they are available in lots of retail spaces in Canada. 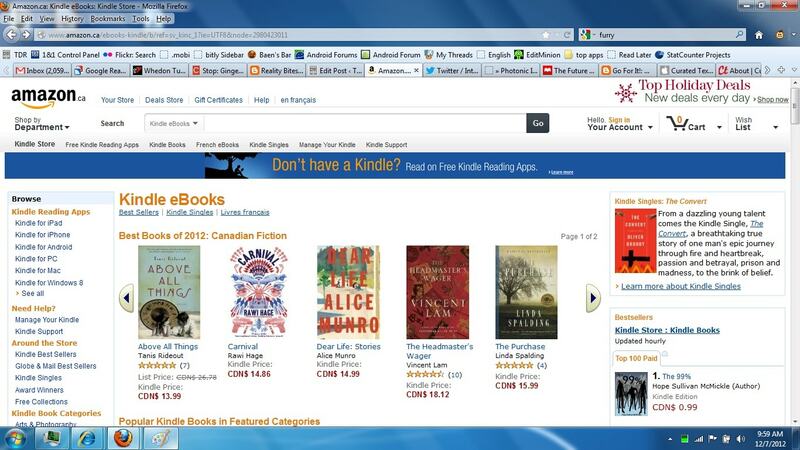 There are plenty of Canadian titles available to purchase on the Kindle. I’m not sure that this is news. The Kindle Fire is not available here. And, if imported manually, doesn’t function as the intended retailing device that it is. The value in launching a local Kindle Store is that it allows authors and publishers to target their sales and tailor their promotions to specific markets. Only Kindle 5th Gen, Kindle Touch Wifi, Kindle Keyboard 3G currently available for Canada! Canada is not America’s hat. Grow up. Please keep you opinions related to technology. Site language seems to default to French. This should make Canadian ebook fans happier. They used to complain about having to pay for Kindle books in US dollars. Some of those complaints weren’t so much about paying in U.S. dollars so much as paying different U.S. prices…Lawrence Block dropped his books at one point to $7.99/$8.99 and the U.S. could snap them up like candy. I was an Amazon customer, buying the same E-file as the American customers, ordering from the same site, no shipping, no extra transaction costs, etc. etc. etc. and yet I had to pay $11-$13 for the same book because my mailing address is in Canada. And you can’t spoof the address without going through a LOT of hassle with VPNs, etc. or getting a PO box across the border. A little bit of a reality check…Amazon.CA is not a new site, it has been operational for over five years. It sells just about everything Amazon.COM does, except for Kindle titles and Kindle machines. When you click on “kindle” stuff, it would just re-route you to the .COM site. Two sites, different logins. But for the first few years, they were virtually indistinguishable on other content — in fact, if you looked for a book on the Cdn site, it would show you reviews from the .COM site too. When Kindle first launched, Amazon wouldn’t ship for a couple of years to Canadian addresses — the problem was the wireless version of Whispernet. They didn’t have a Cdn wireless company to provide the network for it, and our domestic wireless costs have traditionally been way higher than U.S., so not really a money maker for them. But three years ago, they started shipping direct for machines, and just under two years ago, selling the machines directly in stores (base machines, not the high-end tablets they have now). Still from the .COM site, but shippable. However, Kindle books were not available “directly” on the .CA site either…you would get redirected to the .com site. At which time, you had access to about 90% of the US titles, leaving out 10% or so for those publishers who (a) didn’t check the “make it available in Canada” box when they uploaded; (b) had U.S. rights but not North American rights; or (c) talked to someone in the RIAA who told them all of Canada were pirates because our laws were older than the U.S. ones, and just as ineffective. Or, it was idiotic comglomerate rules that HarperCollinsUSA had put it up, but HarperCollinsCanada hadn’t signed off or something, so it wasn’t available to Canadian subscribers. You could however get it on Apple in both countries, or Kobo in both countries, or on Nook in book countries. Just HC being idiots with left and right hands not collaborating. Really freaking annoying, but not a real trade issue. The real news is not a new site or a new Kindle store but that the new site might (and I say might with a dejected perspective) fix a bunch of wonky pricing problems. Lots of times you’d look at a book on Amazon.COM that was $8.99 for the paperback, $11 or more for the Kindle version, and see it listed on a discount site as discounted to #2.99 (but not available at that price when Cdns clicked). But going back to original source, it has nothing to do with fears of foreign investment, and never has. It is about the fact that Amazon didn’t have reason to invest in Kindle.CA site since we already had all the paper books plus 90% of Kindles books already, and we could already get Kindles machines. Opening a .CA site is nothing more than a domain name, really…heck, a bunch of Californians who don’t know any better have gotten .CA domains thinking they were for California and I assure you, they weren’t “investing” in Canada. What has changed to prompt the Kindles on a .CA site is that Kobo is actually now a working viable reader and gobbling up Canadian market share like a literary Pacman. The first few Kobos were so slow, and so error-prone, that the Kindle seemed to many to be lightyears ahead. Plus Amazon had >500K books at the time, and Kobo had less than 50K when it started. But Kobo has competing quality products now that Cdns are buying in droves because there is a store to go to, you can see the product, they think they are buying Cdn (don’t ask about the shell game on that one), and Kobo even announced recently they will now do self-publishing. Amazon can’t just count on their size and quality anymore, they actually need a newly tweaked presence. And even more important for Xmas, the Kobo has their nice shiny top of line tablets available in Canada which Amazon hasn’t yet (same free wireless problem, our cost differentials are almost prohibitive). This is likely correct, but Kobo was also an obvious threat in the Canadian market 2011. Why didn’t Amazon launch the site last year? Again, I say regulatory hurdles delayed the launch. Digital sales of video games are also not available on Amazon.ca (you can only order physical CD’s). 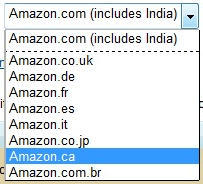 Prior to December Canadian Kindle ownwers bought their ebooks at amazon.com in US funds, making sure to choose country designation “Canada.” The “Canadian” US dollar price was always higher than the “American” US dollar price. Now, as of Dec 7, Canadians can buy ebooks at amazon.ca in CAN funds and the Canadian price at .ca is CHEAPER than the “Canadian” price at .com. But, in order to buy at .ca you must transfer your account. When you do this, you will lose access to all subscriptions and periodicals, no access to music or cloud player, no access to video, possible limited or no game subrcriptions. If you do not switch your account form .com to .ca and you shop at the storefront using your kindle device, you will pay the higher “Canadian” non-.ca price and not even know it. Can dollar is worth slightly more than US dollar but close enough to call it par for comparison purposes. Seems, like Amazon is forcing customers to sacrifice content or pay like a sucker. Not a good way to build customer satisfaction. And as of this weekend, Canadians are blocked from buying any Kindle books on amazon.com, except those sold by Amazon Digital Services. This is effectively forcing Canada based Kindle users into switching to the amazon.ca store, despite all the disadvantages of doing so. The longer you’ve had a Kindle, and the more use you’ve made of it, the more you have to lose by switching. A great way to reward customer loyalty. I’d like to buy a book & have it online on my iPad bookstore – that’s all I wanted. Guess that’s not what this website is about. It’s just a bunch ic conspiracy theorists. Guess I will buy my book elsewhere!